Although the M11/9 is a great, fun buzzgun, there's a reason that many owners buy slowfire uppers from Lage -- they make the gun more "practical" (if there is such a thing for a submachinegun) and definitely more controllable. But if you preferred to stay with the factory profile and stock, you were out of luck as far as slowing it down... until now. BBIC LLC of Boykins Virginia recently came out with their CF-W SlowFire Bolt as a replacement for the factory bolt in a factory upper. This heavier steel and tungsten bolt cuts the rate of fire (ROF) by at least half with no other changes to your M11/9. This makes it a wonderful alternative to firing with the factory upper, even if you already have one or more of LAGE's MAX slowfire uppers like I do. I ordered a CF-W bolt and received it a couple of weeks later. The quality and finish is good, and the fit in my 1986 original upper is excellent. The new bolt is substantially heavier than the factory bolt, but when assembled into the complete loaded gun, the weight difference in your hand isn't noticeable. 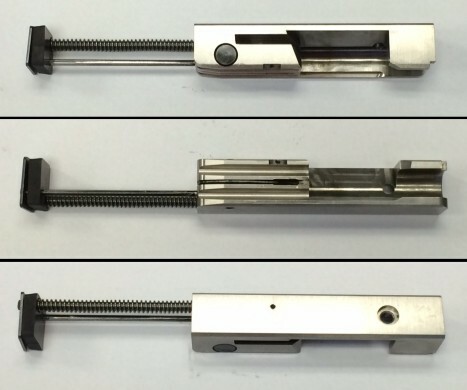 These bolts are made by using a standard M11/9 new production bolt, cutting off the back, welding a machined tungsten block to it, and then tuning the recoil spring for the heavier weight. There is actually more to it than that, and in talking with the company owner, I know that there was a lot of trial-and-error to get the best mix of lowered rate of fire and reliability. Today, as I'm writing this, I've just returned from the shooting range and my first test of the CF-W SlowFire Bolt. The bottom line is that I *really* like it, and quickly decided that my factory bolt is going into retirement, with the CF-W bolt used as the new standard for my factory upper. 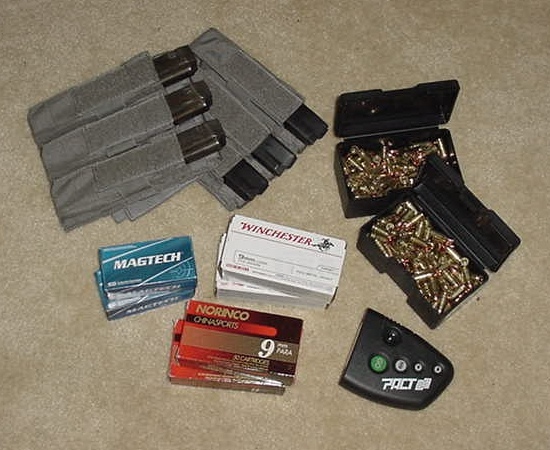 For the range test, I used 100 rounds each of four different types of 115 grain 9mm ammunition: Winchester "White Box", Magtech, Norinco Sports, and my own reloads. I tried both Z-Mags and PAM mags. There was only one mis-feed all day, which was round #2 in the first Norinco magazine jamming after a stovepipe of round #1's attempt at empty case ejection, which almost certainly was not a bolt issue. Additional magazines of the Norinco ammo fed perfectly, as did all the rest of the ammunition that I tested. Using my PACT timer, I did a comparision of a magazine dump of Winchester White Box ammo with the factory bolt and then the CF-W bolt. I'm not going to post the actual numbers (your mileage may vary), but suffice to say that the CF-W bolt indeed ran at half the rate of fire compared to the factory bolt -- in fact 51% slower. That's not trivial -- it's more like night-and-day. This puts ROF performance on par with the LAGE MAX-11 and MAX-31 upper speeds but in a more compact, factory-looking configuration and makes it significantly more controllable. After the primary testing, I also ran a couple magazines of my reloads with a Bowers Vers9s suppressor on the gun. The package performed equally as well as it had with the bare barrel, just nicely quieter. Although the price is more than twice what you'd pay for a replacement factory-style bolt, it's well worth it. No question about it for me... the CF-W bolt is a keeper! APRIL-MAY 2016 UPDATE: CF has developed a NEW version of the CF-W bolt that is ALL TUNGSTEN. They started shipping in mid-May. Pre-orders were taken but the pre-order list is now closed. Continuing production is expected past the initial production lot, so you should be able to buy the "GEN 2" version even if you're not on the pre-order list. 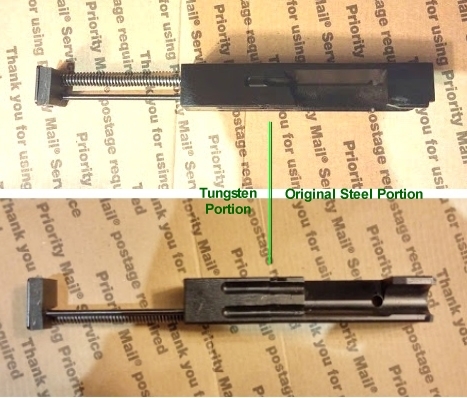 Price for a complete assembled and tested bolt is $300 higher than the GEN 1 version (which is the steel-tungsten "hybrid" version no longer being made that I first got) since it will be all Tungsten, which is not only a more expensive material, but also more difficult to machine. It's worth it though -- I've gotten one of the new ones now and it works as advertised! See the video below and the product photos at the bottom of this page. In the video, notice how well the gun stays on target with virtually *no* muzzle rise, and at the end of the video, notice the ease of being able to shoot singles, doubles and triples at will... try doing that with the factory bolt! Due to the extra weight, the Gen 2 bolt is a bit more "touchy" (particular) than the Gen 1 bolt, and may require some tweaking of your magazines or FCG's trip to make sure it doesn't result in light primer strikes and otherwise works consistently (it did on my gun)... see the "tips" link above this paragraph. SEPT-OCT 2017 UPDATE: There is now a CF-W "A" bolt! What's different? This bolt is designed to let you shoot 9mm through your M11 .380 gun! You do have to put a standard M11/9 barrel in an M11 .380 upper, or take a M11/9 upper and cut the back end off of it (it's basically just a sheet metal square tube) to match the length of factory .380 uppers, but that's it. With your M11 or M11A1 configured this way, you have the smallest, most compact 9mm submachine gun in the world! Rate of fire, like with the original CF-W bolt, is substantially lower than the factory configuration. It's a really nice addition to the collection -- I enjoy mine! I can't quite pull singles with it, but doubles are very easy. The bolt can also be used in the M11/9 for a slightly faster rate of fire than the original CF-W bolt -- just put on an M11/9 sized recoil rod and spring. Contact VEGAS SMG (Tom) at the link below for more info. His webpage isn't currently active, but he keeps his Facebook page updated, including videos of the new bolts being tested. I've now got THREE of the CF-W type bolts... a Gen 1, a Gen 2, and an "A" bolt. They're great, and I have them set up in different hosts or uppers. Highly recommended! But keep in mind that they're a limited production item... if you see one for sale, buy it while you can. You won't regret it... any of them make the M11 a *lot* more controllable and joyous to shoot. There are also M11/9 and M11 specialty uppers available for them from Sam at Practical Solutions (check our LINKS page), respectively called the "Gray Ghost" and "Baby Ghost". I've got one of each of those also. sales are being handled by Tom W (known as VegasSMG on the forums). There's also a .380 version being developed and tested for the M11 and M11A1 *AND* a version for the M10 in .45 ACP!. Stay tuned for more info! Where can I find one? How Much? Why would I need one? plus shipping Cuts the rate of fire by at least half using the factory upper, making it much more controllable.